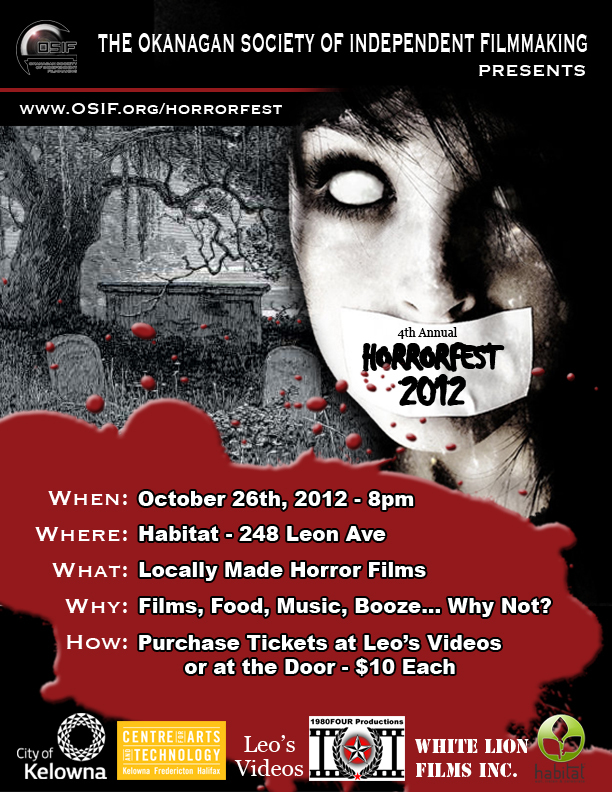 A special and new fifteen minute edit of the Bite was submitted to Horrorfest 2012 in Kelowna. Brian Taylor, Jamie Stuart, Dawn Taylor, Douglas Revak and Dan Toolsie we're in attendence to witness an audience watch "the Bite." I took it with my phone. We had a great time at Horrorfest, which was a well organised event. We saw some great films and discovered that the valley is brimming with talented people. A special thanks to Kelly Veltri and the good folks at the Okanagan Society of Independent Filmmaking, of which we may now so proudly call ourselves a member. Thanks also to the cast a crew of the Bite, our little movie has been viewed around 4000 times so far, and downloaded all over the world.